Today is the 101 birthday of Alan Turing (23 June 1912 – 7 June 1954), a mathematician best-known for helping decipher the code created by German Enigma machines in the Second World War, and for being one of the founders of computer science and artificial intelligence. He was a visionary (a hero to Google), a long distance-runner (capable of world-class marathon standards), and a gay man before his time. A lot can be said about this great man, nevertheless this woman has chosen to draw on his name in order to object to gay marriage. Last week, in the midst of the nationwide protests, the Brazilian congressional human rights committee approved Feliciano’s “gay cure” law that would allow psychologists to treat homosexuality as a disorder or pathology. Outside the State House, there are many more gay rights protesters than anti-gay marriage demonstrators. One of the anti-gay marriage proponents, Susie Hicks from Woburn, said this was because everyone thinks gay marriage is a “done deal.” She was at the State House with her friend Angela Mitchell, also from Woburn. Mitchell held a sign that read WE WANT THE BAY STATE NOT THE GAY STATE, THAT WOULD MEAN A SAD STATE. Her sign was in sharp contrast to some of those held by gay marriage supporters that focus on gays who’ve made history such as Leonardo da Vinci, Alan Turing, who invented the computer, and Katherine Lee Bates, who wrote “America the Beautiful.” The sign focusing on Turning, for example, reads: DESTROY THE COMPUTER! 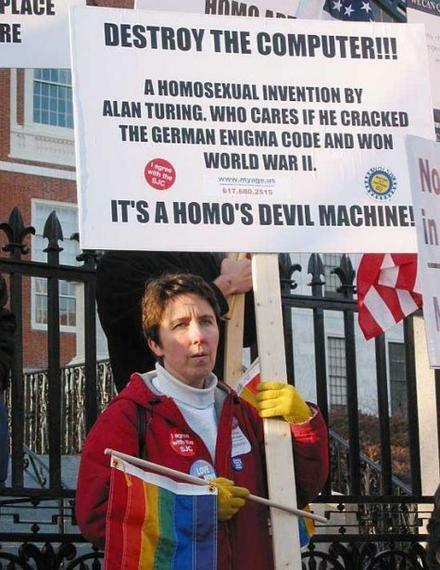 IT’S A HOMOSEXUAL INVENTION BY ALAN TURING. WHO CARES IF HE CRACKED THE GERMAN ENIGMA CODE AND WON WORLD WAR II. IT’S A HOMO’S DEVIL MACHINE. yes. A part of the story…. another hint is the situation going on in Brasil and the Feliciano´s gay cure law… neoliberalism uber alles….